Inspired by The Herald’s own creator, four friends follow their passion for gaming and create family-friendly hands-in brains-on fun with one spin-chilling twist ­– you must escape … or else! Darkness. Grab a flashlight. The thin ray of light cast before us is more ominous than comforting. Freaked out a little? Good! Now you’re ready to play the game! (Cue evil laughter). OK. Maybe that’s a little dramatic, but then drama’s the point here at Escape Quest. 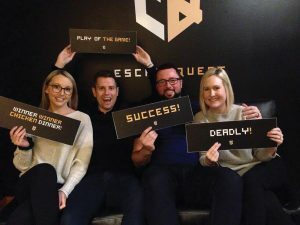 Located on Duckworth Street, Escape Quest’s vibe feels more party-like than downtown-core businessy, but then that’s quite alright according to one of four co-owners, Kevin Noseworthy. 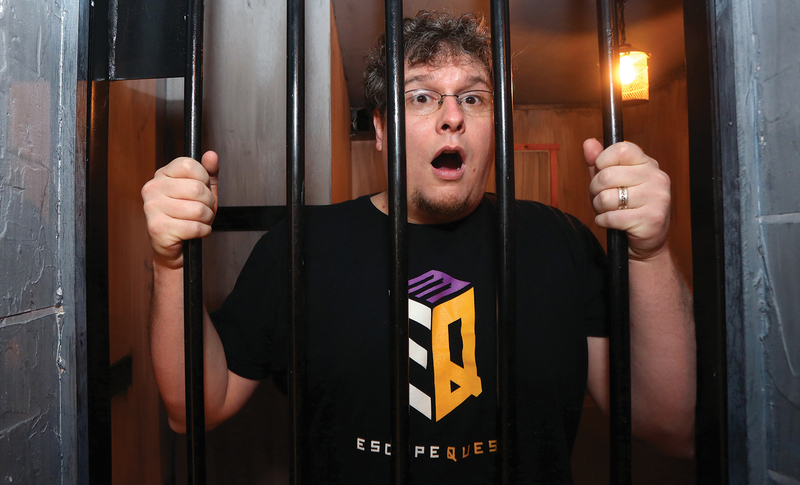 Noseworthy, who’s the Operating Manager, shares Escape Quest’s quite tantalizing birth story. “We opened our business in 2015, but we started planning exactly a year prior,” he begins. The reason for the cone of silence? An idea was forming. The two wrangled up Nicole Kelly and Mark Webber and together, the four friends started a business plan. The foursome had worked on large-scale use-your-brain challenges before, having put off Survivor-styled events in the past. In the beginning, there were two rooms; Undead on Duckworth, a zombie apocalypse-styled room, and 1892, based on the city’s historic fire. 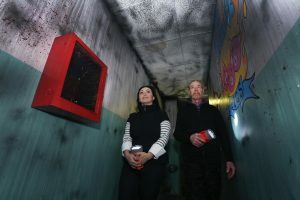 With escape room back-stories that include mad scientists, secret experiments, looting, and being abandoned in a city lock-up as fire rages outside, what’s not to love about either? Patient 709, another escape room, is a direct sequel to the team’s original zombie concept. Or check out Taken by the Fairies which is based on this province’s rich fairy folklore. And then there’s the Atlantis/Newfoundland Broadcasting connection. “There’s a super hero saga based on a super hero villain called the Lost Atlantian. We drew our inspiration for this character from the Captain Atlantis and Captain Canada comics created by the Stirlings. The character’s name is Starling Gould, which is a reference to Geoff Stirling,” Noseworthy explains. Like most in this province, Noseworthy and his merry group of gamers-turned-entrepreneurs, were raised on NTV and The Newfoundland Herald. The team created the escape room, Lost Colony of Atlantis with that as their inspiration. “The ruins are buried beneath the East Coast Trail and can only be reached via tunnel near the ocean floor, and you can only be in there for one hour before the ocean seals you inside.” How delightfully terrifying! Darlene Reelis and William Jordan take on the challenge. Armed with knowledge and a flashlight, and a strong will to survive against the odds, they prepare to solve puzzles inside Escape Quest’s walls. How does the game work? Teams (minimum of two, maximum of eight) have one hour to play once the clock reads 59:59. They then have one hour to search for clues and solve puzzles in order to escape and live to tell the tale. The success rate is over 50 per cent and with unlimited hints – if needed – and obstacles galore – there’s challenging fun for all, and for all ages. “I used to be a teacher, so we kept age in mind. Anyone over grade four can solve the puzzles and are able to play the game. Those six and under play for free and while they might not solve the puzzles, they have fun with their family and the fun and excitement of a door opening or a box opening to see what’s inside is universal whether you’re six or 96,” Noseworthy explains. While there’s multiple escape rooms, and returning time-after-time is possible (and suggested), the foursome continue their search for new and exciting escape rooms. Anything tantalizing on the horizon? Oh yes! In fact, The Herald will possibly soon be part of a new escape room concept based on a 90’s theme. Noseworthy is more than happy to provide clues and hints – that is, after all, what’s he’s good at! As an Entertainment go-to, The Herald is a great reference point for anything 90s, he continues. “Different bands or shows or movies. Actors and singers who were popular at that time. We really want to have those references in that room and The Herald is the natural conduit for that,” he says. Exciting and intriguing. Like Escape Quest itself. Noseworthy laughs. That energy is something he and the team are quite proud of, he admits.